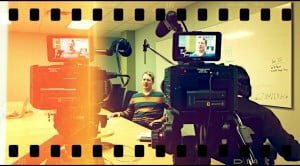 5 Editing Tips for Better Business Video | Rewatchable, Inc.
One of the toughest aspects of editing corporate video can be the sheer amount of footage you have to process. A great way to get to know – and reduce – the footage you’re working with is to shrink it down a bit. For unscripted edits, we’ll put everything into a timeline and make a few passes through it just removing dead air, flubs, and awkward takes. The job of creating a great corporate video is a lot less daunting when you’re working with less than half the footage. For example, the recruiting video to the right was created from over 9 hours of interviews. Part of the benefit of watching your footage – all of your footage – is that a lot of times, the story will show itself to you. For some editors, it can help to actually write down, in either outline or long form, the complete story prior to cutting any footage. If I don’t have the entire story clear in my mind, I’ll start out by pulling a great beginning a great ending, and a few key points. Often, just having the subject(s) on screen and speaking coherently will make finding the rest of the story obvious and natural. The biggest mistake most editors make when when starting out in business video is overuse of transitions. Transitions are like punctuation in the language of video editing. Would you put an elipsis in the … middle of your sentence? Nope, so leave that cross dissolve on the shelf for when you really need it. Of all our editing tips, this is the one ‘must’ if you want to take your videos from amateur to professional. If time permits, when you’re done with your first cut, step away from the edit for a few hours or days. Even just go for a walk if time is tight. The task of taking a massive amount of footage and turning into a compelling corporate message can often leave you ‘too close’ to the material. You fell in love with this line or that line, or maybe tried to cobble a cool-looking piece of b-roll in where it didn’t belong. When you view your footage with fresh eyes, it’s often easy to see where to make the last few cuts, or where you might need a little something more to take your video from good to great. Congratulations! You’re done with your video! You polished it up, everyone’s saying the right thing, you’re ready to hand it off. Not so fast, bucko. The first rule of great corporate video is that the best corporate video is the shortest one you need to convey your intended message to your intended audience. Can you lose any of that great footage? Is anyone at all redundant? This is the part we call ‘cutting muscle’ at Rewatchable – the part where you’re cutting GREAT clips that you don’t absolutely need. Of all our editing tips, this one hurts the most, but again, it’s often the difference between an engaged viewer and an impressed-but-bored viewer. Have you run into these, or other, editing challenges? Let us know below in the Comments!